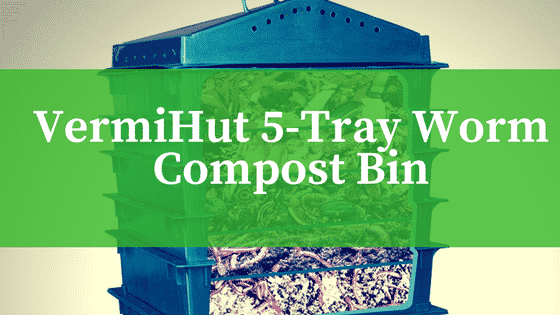 VermiHut 5-Tray Worm Compost Bin Review 2018: Does It Work As Promised? Worm composting systems are becoming increasingly popular, particularly for people who live in apartments and have balconies rather than gardens. However, very often, these compost bins are not overly functional, and they certainly aren’t attractive. In comes the VermiHut, which is the second composter in their range, the first one having just three trays. It is compact, it can be expanded, and it is stackable. They also promise that it is very easy to use. How much of that is true? Starts after around one week. 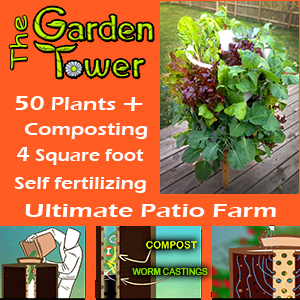 Rapid and efficient composting. One of the most unique things about this product is that it is virtually odorless. What this means is that it has a very small footprint, and that you can even use it indoors. This is really important for those who do not even have a balcony, having to manage with window boxes alone. Furthermore, it is very easy to use and very low maintenance. It is also highly durable, but you still get a three years warranty on it. The VermiHut does cost more than creating a worm bin yourself. 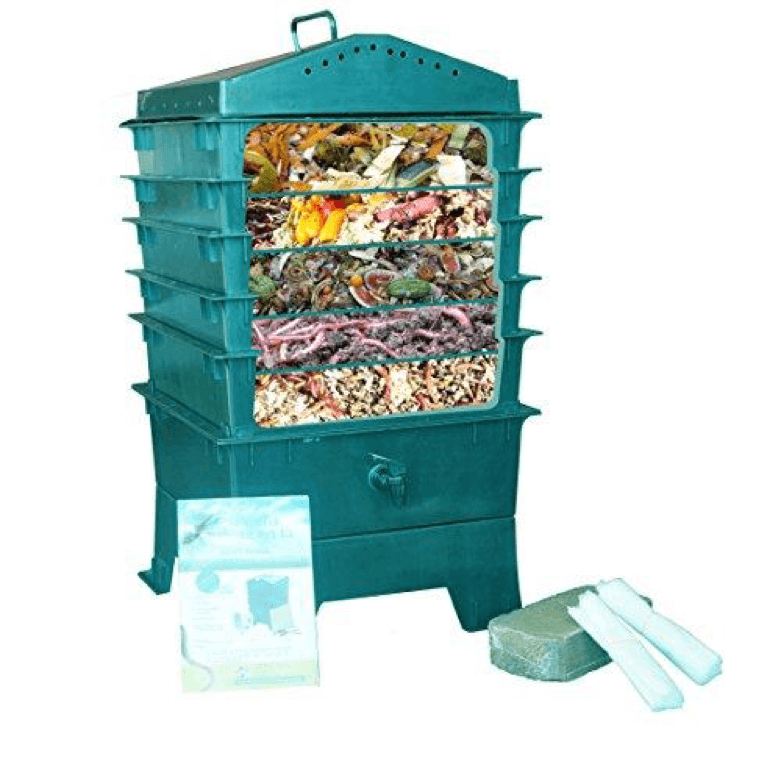 However, compared to other worm bins, it is actually very affordable. One of the things many people like about it is that VermiHut is clearly committed to sustainability themselves, with the worm bin being made of 100% recycled plastic. It comes with a compact base and small footprint. It comes with a lid, five stacking trays, a liquid collection tray, and a pedestal base. The lid looks almost like a roof and has both air holes and a handle. The lid doesn’t sit very tightly, which is doesn’t need to, but you can add plastic clips if you want it to be sturdier. The worm tea can be collected thanks to the included spigot. As standard, you get a rake with your purchase, and you can also buy optional extras, including compost buckets, pH meters and moisture meters, and themometers. You do, however, get drain cloths in your package, as well as coconut fiber. You have to purchase your own worms, but that isn’t difficult. The kit comes with an easy to follow instruction booklet, which explains that you have to place the fabric in such a way that the worms can neither drown nor escape. It is quite easy to prepare each tray, and you only have to start with the first one. Once the worms have worked through it, you can add more trays. Although the VermiHut is a five tray worm farm, you can increase it to as much as seven trays if you want. Once you have built your tray, you simply add your worms on your top bedding layer. The booklet clearly explains that it can take as much as a week for the worms to adapt. Indeed, those who have used the trays in the past have noted that, while the worms burrow in, they don’t start eating until another layer of moist newspaper is added after a few days. Once it starts to work, it really is an excellent device. You only need a small bit of space to create lots of compost, particularly with the moisture and airflow that allows for rapid composting. This makes the entire tower very efficient. Of particular benefit is also the fact that, once your worms have settled in and feel at home, which takes around one week as stated, the bin is really low maintenance. 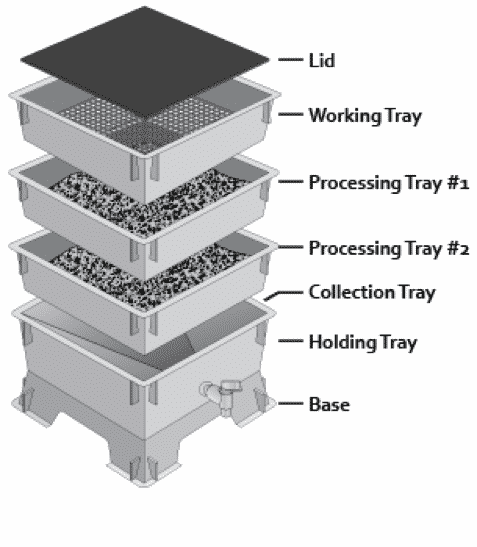 You simply add more trays and material as and when you need to. The worms automatically migrate to the higher bins, where the fresh food is found. As a result, all you need to do is harvest the compost from your bottom bin and reuse the tray as a top bin when you need to. Basically, whether you use the bin inside or outside, you are essentially feeding worms with food scraps. The bedding means that the worms are happy to call your bin a home. The worms start to eat your scraps, which they digest. Once ready, they start to go higher up, to the next tray. What they leave behind is a rich casting. What makes the product so special is that, because the worms travel up, you don’t have to separate them when it comes to using your compost. It is a very compact composter. This means it is suitable for homes with small gardens, balconies, or window boxes only. The VermiHut is fully expandable up to seven trays. This means that if you produce more compost than you can use, or you have more scraps, the bin will be able to cope with it. The bin is stackable, which means that it grows upwards rather than sideways. If you have enough space for a single tray, you also have enough space for the full seven trays should you need them. It is very easy to use, with the worms doing all of the hard work. Plus, the worms automatically travel upwards, which in turn means that you don’t have to separate your new compost from the worms either. The VermiHut is more expensive than building your own worm farm. However, it is also a lot more convenient. It does need more assembly than other bins, but this is mainly due to the fact that it has addable trays. Similar bins are reported to have stronger plastic, although there have been no complaints of the bins breaking. Is The VermiHut Right For Me? Best suited for: People with little to no outdoor space. Not suited for: People with very large gardens. If you are hoping to be more sustainable by reducing your carbon footprint and composting, and particularly if you have no garden of your own, then the VermiHut worm composter is everything you need. 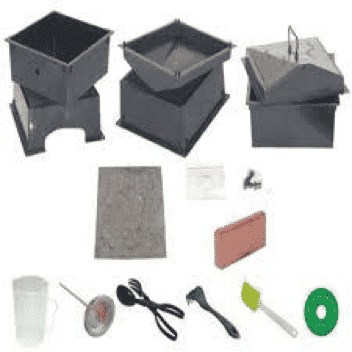 Easy to use, this is one of the most efficient worm bins on the market today. It isn’t perfect, but it comes very close.